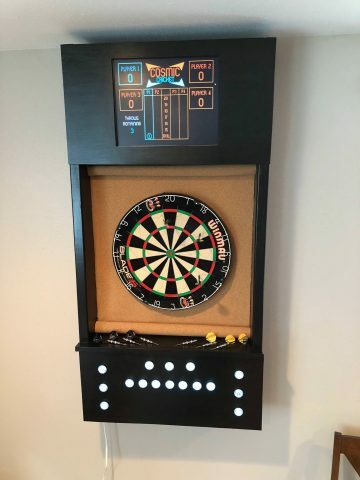 Darts and an Online Game with a Raspberry Pi @Raspberry_Pi #PiDay #RaspberryPi « Adafruit Industries – Makers, hackers, artists, designers and engineers! An Imgur user and his brother have built a dartboard scorer surround and inside is buried a Raspberry Pi. Button presses to keep track of the score are detected by an Arduino Leonardo and these are then fed into a Pi which translates them into calls which keep track of the score on an external website. The website is then displayed on an old monitor by the Pi, using Chromium in kiosk mode, to show the scores.